Celebrating 100 years of Peter Pan, this fourth volume in the Centennial Studies series explores the cultural contents of Barrie's creation and the continuing impact of Peter Pan on children's literature and popular culture today, especially focusing on the fluctuations of time and narrative strategies. This collection of essays on Peter Pan is separated into four parts. 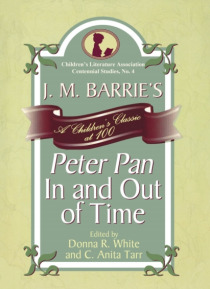 The first section is compr… ised of essays placing Barrie's in its own time period, and tackles issues such as the relationship between Hook and Peter in terms of child hatred, the similarities between Peter and Oscar Wilde, Peter Pan's position as an exemplar of the Cult of the Boy Child is challenged, and the influence of pirate lore and fairy lore are also examined. Part two features an essay on Derrida's concept of the grapheme, and uses it to argue that Barrie is attempting to undermine racial stereotypes. The third section explores Peter Pan's timelessness and timeliness in essays that examine the binary of print literacy and orality; Peter Pan's modular structure and how it is ideally suited to video game narratives; the indeterminacy of gender that was common to Victorian audiences, but also threatening and progressive; Philip Pullman and J.K. Rowling, who publicly claim to dislike Peter Pan and the concept of never growing up, but who are nevertheless indebted to Barrie; and a Lacanian reading of Peter Pan arguing that Peter acts as "e;the maternal phallus"e; in his pre-Symbolic state. The final section looks at the various roles of the female in Peter Pan, whether against the backdrop of British colonialism or Victorian England. Students and enthusiasts of children's literature will find their understanding of Peter Pan immensely broadened after reading this volume.